Geneticists have made a stunning breakthrough, at least in their own minds. Though not quite ready for human application, they have “edited” DNA to cure a disease in an adult animal. News reports don’t quite put this development into perspective. It is one thing to insert a new gene in animal eggs so the next generation can benefit but quite another to do this in a fully developed adult with full-blown disease. What this means is that single-gene mutation diseases humans were born with can possibly be cured today, not just corrected in the next generation. Now only a small percentage of all disease, about 2%, is caused by inherited conditions due to a gene mutation. Most of these inherited diseases being what are called enzyme deficiency storage diseases emanating from a single gene mutation where normal disposed of biological material (cholesterol, cellular debris, etc.) accumulates instead of undergoing enzymatic degradation. So the idea that gene editing will apply to the masses may be misleading, but it is a remarkable milestone even if it has only been demonstrated under experimental conditions in the animal lab. The new technology allows geneticists to make DNA changes at precise points on chromosomes (bundles of DNA). The mechanisms involved are better described elsewhere. But to synopsize, DNA is composed of letters A, G, C, T which stand for adenine, guanine, cytosine and thymine – what are called nucleotides – the rungs on the DNA ladder. DNA editing corrects a single misplaced (out of sequence) letter in the genetic alphabet. In this instance, biologists employed high-pressure intravenous injections to insert a new letter in the DNA ladder to prevent the fatal buildup of the amino acid tyrosine in the liver of lab animals. Otherwise this liver disease is treated with drugs and a special diet. High-pressure intravenous treatments are not practical for humans and biologists are experimenting with the use of harmless viruses to “carry” the DNA letters to their target DNA. This DNA-corrective treatment would only be applicable for single-gene disorders like Huntington’s disease, muscular dystrophy, sickle cell disease and cystic fibrosis. Single gene diseases only occur in one person among thousands. In the above mentioned gene editing example, geneticists corrected a condition known as tyrosinemia that affects only 1 in 100,000 humans. In 1990 the first semi-successful human clinical trial using gene therapy was successfully demonstrated for an enzyme deficiency disorder (adenosine deaminase deficiency). So frankly, gene editing isn’t news, it is old information. The most obvious application of this gene editing achievement would be to rally the scientific community to restore the capacity to produce vitamin C in the human liver. Most animals (except for guinea pigs, fruit bats and primate monkeys) synthesize their own vitamin C, enzymatically converting blood sugar to ascorbate as it passes through the liver. But humans have an inherited genetic flaw and can’t produce vitamin C due to a genetic mutation that occurred many generations ago. This single enzyme deficiency (gulonolactone oxidase) if repaired would likely result in an astounding prolongation of human health and longevity. The most pressing application of gene therapy would be for cancer, since it is conceded that “the majority of cancer therapies have a dismal outcome.” The lack of fervent research and contentment with existing toxic cancer therapies can only be explained by the insurance billing codes that reward oncologists for failure. The problem is that most cancers involve many genes, not just a sole gene mutation where a single letter of the DNA ladder is out of place or missing. 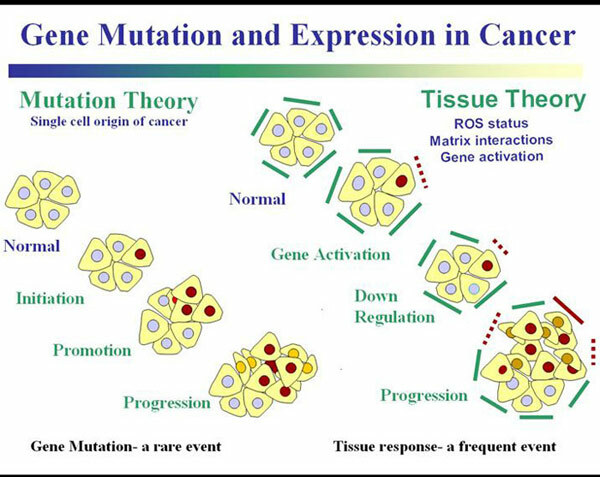 While cancer is generally described as a slow process where gene mutations accumulate to produce pre-cancerous and then fully malignant cells. However, it is now recognized that cancer is an epigenetic disease as much as it is a genetic disease. Cancer involves hundreds of genes out of a library of 25,000 genes. Only epigenetics addresses such a broad number of genes. While oncologists have long attested that accumulated gene mutations progress toward cancer they now tacitly concede their own misdirection, stating that “epigenetic alterations may be the primary initiators of cancer development.” This may help explain the failure of modern cancer therapies. While changes in the sequence of DNA are considered a hallmark of the malignant process it is now recognized that epigenetic changes precede and provoke genetic changes. These epigenetic changes involve many genes which must be addressed by molecules that have broad biological action, not just target a single gene. This points to a giant misdirection in the past decade that persists today – extolling gene therapy that cannot possibly cure. Yet single-gene cancer therapy ends up on the front pages of the most prestigious news outlets. It is now said that “the epigenetic revolution has arrive for biology.” As evidence, four FDA-approved cancer drugs that have epigenetic targets are cited. OK, OK, shall we get excited about an imminent cancer cure? So far, epigenetic drugs have only been proven to slightly prolong survival and to be less toxic than conventional chemotherapy. Cancer researchers are saying they have reached the “tipping point for epigenetic therapies in cancer,” claiming epigenetics “has exploded in the last two decades.” But where are the cures? There is so much gobbledygook about so-called personalized medicine using gene therapy that is proposed to overcome the drawbacks of modern cancer treatment. Epigenetics is now considered “the key to unlocking the door to personalized medicine.” Epigenetics is now said to be part of personalized cancer medicine. Is modern pharmacology going to develop a drug for one rather than a drug for many? If so, it now costs over $800 million to develop an anti-cancer drug for a specific form of cancer. What would it cost to tailor a drug for even fewer individuals? How will “gene editing” of a single gene cure cancer when malignancy involves many genes, not just one? For clarity, epigenetics can be inherited by a process called imprinting just as a gene mutation may be inherited. But it is also reversible by easier methods than insertion of a new letter on the DNA ladder. The gene therapy cancer frontier should have been crossed in the 1970s. Biologists knew small molecules were switching gene decades ago starting with a small anti-cancer molecule called butyrate. It was recognized in 1978 that butyrate alters something called histone bodies that are involved in one form of epigenetics. Today butyrate is widely known to favorably control genes and suppress cancer. But 36 years have passed and still butyrate, a non-toxic component of the diet (butter) and a by-product of fiber digestion in the gut, is still not utilized in cancer therapy, though some cancer patients are prescribed butyrate as an off-label drug. The well-known drawbacks of butyrate, having a short half-life and not achieving effective concentrations for cancer treatment, were overcome by researchers in Italy in 1999 who combined it with hyaluronic acid to improve its ability to inhibit cancer. A well-known alternative cancer doctor in Texas utilizes molecules that are simply breakdown products of butyrate to treat cancer. What is more revealing is that not only is there increasing evidence that epigenetics plays a major role in the onset of cancer but that natural molecules called phyto-chemicals exhibit strong epigenetic action. The many ways that vitamins, minerals, spice and herbal-derived molecules address cancer have been described as if they are many drugs in one. These molecules are extracted from coffee beans, grapes, tea leaves, vegetables and other herbal sources. These molecules work at the genome-wide level rather than targeting a single gene. Unlike any existing cancer drug, the red wine molecule resveratrol addresses all three stages of cancer development, initiation, growth and metastasis (spread), and is described as exhibiting unusually “promiscuous” biological action (activates many genes), but it has yet to undergo human clinical trials for cancer over the past decade. There are three mechanisms that control epigenetics: DNA methylation (accomplished by use of B vitamins), the wrapping of DNA strands around what are called histone bodies (the tighter DNA is wrapped around histone bodies the more a gene is silenced), and microRNA (which are snippets of RNA that regulate gene expression). Natural small molecules called polyphenols are known to reverse adverse epigenetic changes by all three of the above mechanisms. Therefore, “dietary polyphenol-targeted epigenetics becomes an attractive approach for disease prevention and intervention” say researchers at Rutgers University. Another measurable epigenetic factor is called microRNA that regulates gene expression (protein making) and controls cancer. MicroRNA are considered the guiding hand of the human genome (library of genes). Remarkably, National Institutes of Health researchers found a resveratrol-based matrix dramatically inhibits new blood vessel formation that feeds tumors via microRNA-20b. This resveratrol-based matrix exerted six-fold greater ability than plain resveratrol to inhibit the formation of abnormal blood vessels that feed tumors nutrients. A combination of polyphenols is known to work synergistically (the effect is multiplied) not just additively. There are semi-effective anti-cancer drugs that do the same thing. This same blood-vessel-inhibiting anti-cancer drug is also used to successfully treat an eye disease called wet macular degeneration where new blood vessels crop out to supply oxygen to a starved retina. When that drug fails (15% of the time) the resveratrol-based nutraceutical has been reported to successfully cause abnormal blood vessels to recede. So what kind of drug would that nutraceutical be if it were put to the test for cancer? — © Bill Sardi, Knowledge of Health, Inc. Bill Sardi has a commercial interest in nutraceuticals.